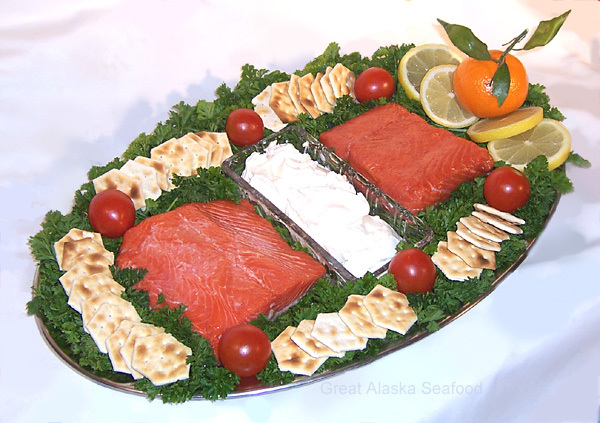 A generous one-pound fillet of smoked Alaska Salmon, along with cream cheese and crackers. Shipped FREE to your door. An ideal gift for your smoked salmon lover's intimate gatherings and smaller appetites. Our smoked salmon is one of a kind, 100% natural; never with any preservatives, nitrates or sulfates. Slowly smoked with our cherry wood chips to create that melt in your mouth richness and flavor that you can only get from smoking Alaska's wild salmon the traditional way (with no liquid smoke flavoring). Enjoy with gourmet crackers and cream cheese (included).